The Bubble Screen has been blamed for everything from the high price of gasoline to the break-up of the legendary Hip-Hop group, The Fat Boys. Former NFL Coach (and Super Bowl Winner) Jon Gruden blasts his Quarterback campers for throwing millions of Bubble Screens while ESPN analyst Ron Jaworski thinks the Oregon offense won’t work for the Philadelphia Eagles because the Ducks run Bubble Screens and not much more. Talking heads on TV that choose to mock the Bubble expose a fundamental misunderstanding of the Spread Offense, as the Bubble Screen is far more than just a quick pass. 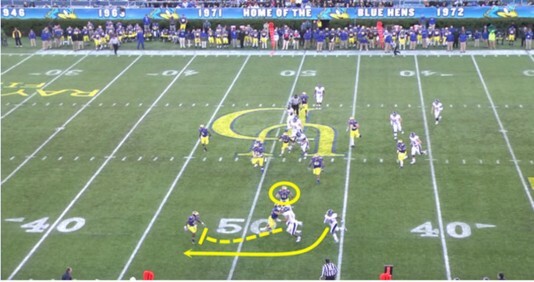 It is the Spread’s most important Constraint play since it is designed to make the defense defend the width of the field and remove defenders from the inside “box” who wish to stop Oregon’s running game. When executed consistently, the Bubble efficiently and gradually tilts the numbers into the offense’s favor. This analysis will examine Oregon’s use of the Bubble Screen Constraint to help build one of the nation’s best rushing offenses. While called a gimmick, a gadget, and sometimes much worse, the Bubble Screen, or Bubble, is in fact built upon the soundest and oldest of football principles of moving the most blockers into an area of the field as quickly as you can. 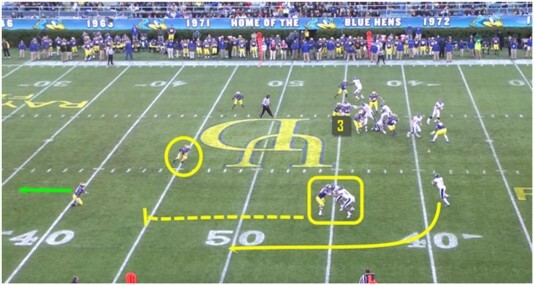 The use of a Bubble screen requires a pre-snap “Bubble Zone Read” and when packaged with the Inside Zone Read is commonly referred to as a “Constraint play.” Having a Bubble Zone Read on the outside of a Spread formation “constrains” the number of players a defense can keep in the box. If a defense chooses to pack the box with defenders they expose uncovered receivers on their flank. If the defense chooses to cover all the receivers in the formation, then they will have the ball run at their front seven, which is now reduced to 6 or less! If you bring a safety in close to cover the formation, you then make the defensive secondary vulnerable to the long pass. The Bubble Zone Read makes the defense choose what to give up, and then has a built in method to take advantage of it! The ideal situation for the Bubble Zone Read is when the defense lines up in a look designed to stop the pass. In the picture above Washington has covered all four Oregon wide receivers in formation (defenders are numbered through this analysis). Washington has two deep safeties backing up the four defensive backs with the #2 defensive backs (or “Alley Defenders”) lined up over each of the Ducks’ slot receivers. The Huskies have given up their numbers advantage on the inside in an attempt to defend the width and depth of the field. The quarterback’s Bubble read starts prior to the snap with a “Yes/No” decision as to whether to throw the Bubble based on the leverage of the defense. 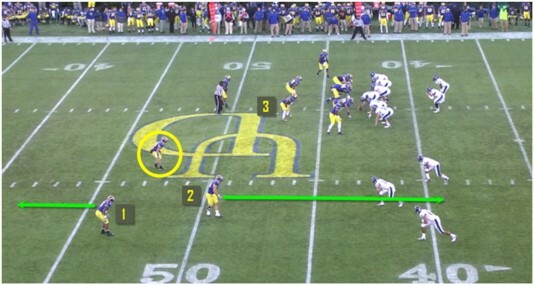 In Oregon’s 2×2 receiver formation above, the quarterback will identify where the #2 defensive backs or alley defenders are lined up. If the alley defenders are covering Oregon’s slot receivers in the formation (on both sides above) and the defense is in a two deep safety look (safeties circled in yellow above), then the offense has superior numbers in the box. When the answer to the pre-snap Bubble read is “No” to the Bubble screen, (as in the case above) then the QB progresses to his Inside Zone Read rules after the snap. In the picture above, Washington lines up in a great run look for Oregon and Mariota gives the ball to the tailback. The deep safeties (circled in yellow above) are never in the quarterback’s count. The safeties distance from the Bubble receiver means Oregon will gain 6 yards or more before contact is made if we throw the Bubble pass. With everyone else blocked, the match-up of the slot receiver (DAT, upward yellow arrow above) vs. the free safety in space is in the offense’s favor. Oregon lines up in a 3×1 formation which has three receivers to the top of the screen (called trips) and a Tight End in tight formation on the right side of the Ducks’ formation. The QB looks at the #3 Washington defender which is oftentimes the middle or “Mike” linebacker at pre-snap to determine whether or not he will throw the Bubble screen. In the picture above, Washington has covered down all 3 receivers in the formation by removing the Mike LB (#3 Husky defender) from the box. Mariota sees a “3 over 3” defensive coverage to his trips receiver formation, a look that equals a clear “No” answer to the Bubble pre-snap question. With the Bubble constraint moving the interior Washington defenders outside, Mariota progresses at the snap to his usual Inside Zone Read progression. Most defenses will start a game giving up the bubble screen and flat area (the short zones on the sidelines for the defense) in an effort to stop the inside run. Good Spread Offenses will get the edge blocked by the wide receivers and take this open area of the field until the defense is forced to adjust. The picture above vs. Arkansas State is a great example as the Red Wolves have committed to outnumbering the blockers in the box to stop Oregon’s Inside Zone Read run game. By doing so, Arkansas State has also left a receiver outside uncovered, thus they are exposed to a potential explosive play on the flank. With only two defenders lined up over three receivers and a free safety (circled in yellow) sitting deep, the pre-snap read for the QB dictates that the ball goes outside to the Bubble screen. 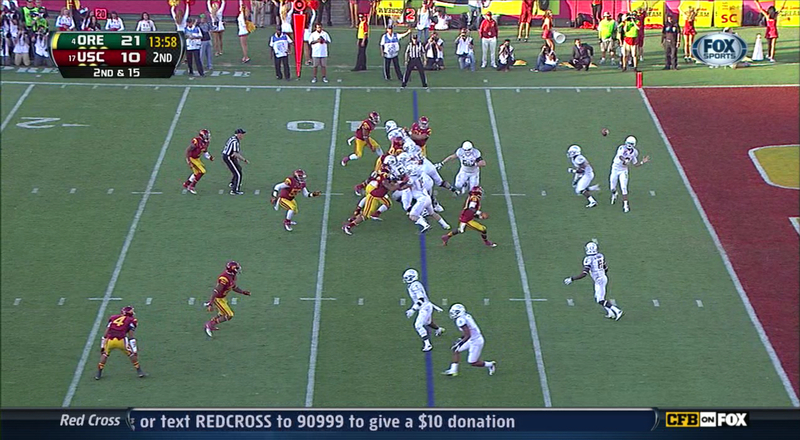 A quick throw and decision by Mariota gets the ball to the perimeter. Great edge blocking by the Ducks’ wide receivers turn a short throw into a long gain. With the #1 and #2 defensive backs blocked, the free safety (circled) is now forced to travel from hash to numbers to make the play. Once he gets there the free safety must try to tackle one of the most explosive players in the country in space, and THAT is a match-up the Ducks want and which the Bubble Zone Read strategy has created. How do Opponents Counter the Bubble? This season USC attempted to stop the Oregon run game by loading the box and playing one deep safety, while the Ducks responded to this look by taking what the defense gave them. Southern Cal has the Mike LB (#3 Trojan defender above) in the box and leaves Oregon’s most inside wide receiver of the trips uncovered, thus the Bubble Zone Read results in Mariota throwing the ball to the Bubble receiver. 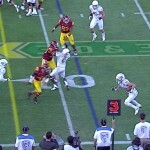 Oregon’s receivers get the alley defender blocked (Inside Trojan defensive back above) by executing a double team technique that the Ducks have perfected. When the Trojan corner backs up, (Green arrow above) the two widest receivers for Oregon maneuver into position to block the alley defender of USC. They work together to secure this block as this defensive back is the most dangerous defender to the Bubble screen. The free safety (circled) is too deep to tackle the bubble runner prior to a huge gain. A great example of this double team technique by the wide receivers occurred in the 2011 Oregon vs.Stanford game. When the corner lines up deep, then both Oregon wide outs block the alley defender first. The widest receiver helps the slot receiver secure his block on the alley defender before leaving to block the corner. The inside slot receiver knows his outside help is there only temporarily, and works to overtake the alley defender as the double team block progresses. Once the inside receiver is in good position to finish his block the outside receiver “chips” off to his new blocking responsibility which is the soft corner. When the double is completed, both wide receivers end up engaged with their man and square to the field. Their pad level is outstanding – with the crown of their helmet underneath the defenders chin. Both receivers have their hands inside and are in excellent body position to strain and finish the block. This precise execution/pass off of the double team leaves the Bubble runner a clean area to run outside the numbers. After researching the Oregon offense we used the double team technique at Villanova to improve our perimeter blocking and leverage. In the regular season finale at Delaware we faced a look that tried to force us to throw the Bubble into a difficult edge. The pre-snap read of the Mike LB in the box (the #3 defender above), with our most inside trips receiver uncovered was a “Yes” for the Bubble Zone Read to make the throw outside. Yet notice the free safety (circled in yellow) is up much closer to the line of scrimmage than how USC defended Oregon. Delaware also countered by trying to out-leverage our edge blocks with the alley player (#2 defender above) attacking the bubble at the snap to defeat the blocks and the play. Our QB makes the proper Bubble Zone Read and gets the ball to the Bubble receiver. The corner is dropping back deep (green arrow above) and thus allows our most outside receiver to work a double team with the inside, or slot receiver. The double team block provides the time needed for our Bubble runner to get out to the numbers and into open space. After the double team block is secured our outside receiver chips off to block the corner. The unblocked free safety (circled) fills the gap inside the double team, allowing the Bubble runner to run to the outside of the mash of players. Both receivers stay square to the field and in doing so get their blocks and the edge secured. The result? Great execution and effort by our players to get us a key first down! When you’re watching a Spread Offense this fall, look a little closer at the Bubble screen and watch how defensive fronts are compromised trying to defend the Bubble constraint threat. 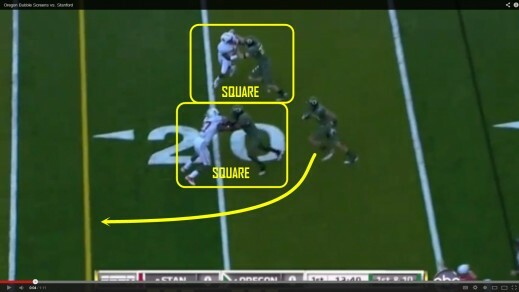 Whenever you see a well blocked edge by the Oregon receivers, you will know that long interior runs and deep play action passes are sure to follow (See my upcoming FishDuck.com Analysis). Taking the time to study the Spread Offense comes with it an understanding that the Bubble is no gimmick, gadget or joke. It is the jab that the great counter-punchers/play-callers use to set up knockout shots in the decisive rounds. It is the 3-point specialist who stretches (and then busts!) a zone defense in basketball. In the video below are examples of Bubble/Inside Zone Read within a game plan—as big plays emerge later in the game. Now we understand the major reason as to why they often do, as in the Spread Offense the use of the Bubble Zone Read and the complementing Inside Zone Read are oftentimes the winning edge. Watch the video below as it wonderfully illustrates the Bubble Zone Read. This and other videos can be found among the Tutorials in the Directory or in the Video Archive section of the site. Find them by going to the grey tabs at the top of the page and enjoy! Football Analysis articles are new every Tuesday and be sure and check our Recruiting Update every Wednesday and a Chip Kelly Update every Friday!